This is a quarter-final tie between two teams who have very strong records over the course of the season and we could be in line for a cracking match. This means that the home crowd are likely to be noisy but there is always a terrific atmosphere in the Pais Arena in Jerusalem. This Tuesday night game could be one of the most exciting EuroCup quarter-finals matches of the week so let’s hope that the match lives up to its billing. The hosts have a 10-4 record over the course of the season and they have been pretty consistent so far. They picked up a 5-3 record in the regular season and then followed this with a 5-1 record in the Top 16. They know that a win here gives them a great platform to push forward but it isn’t going to be straightforward. This is because they face a side with an 11-3 record. Gran Canaria picked up a 7-1 record in the regular season and then followed this up with a 4-2 record in the Top 16 so both of these teams know how to win basketball games. 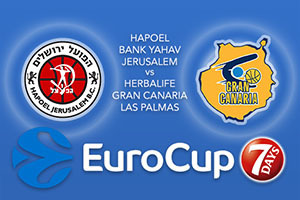 Both teams also know how to win the EuroCup as Gran Canaria triumphed two seasons ago and they were in the semi-finals last year. Jerusalem were winners in 2004 and were last in the semi-finals back in 2006 so there has been a bit of time for them to find joy but there is an air of expectation from the fans. Curtis Jerrells has been a key player for the home side, providing an average of 17.1 points per game while Amare Stoudemire has notched an average of 12.8 points per game over the course of the campaign. Kyle Kuric has chipped in with an average of 15.9 points per game for Gran Canaria while Bo McCalebb has offered an average of 10.7 points per game. The bookies think it will be tight and you should consider backing Herbalife Gran Canaria Las Palmas at +1.5 which is provided at odds of 1.90. When it comes to the Over/Under market, look to go UNDER 160.0 at odds of 1.90. Bet Now!